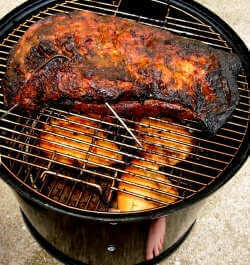 Here you'll find meat smoking tips, step-by-step tutorials, and general information about the world of smoker cooking. Explore the following pages...you just might find that nugget of wisdom that will take your meat smoking to the next level. My Favorite Woods for Smoking Different types of smoker woods create different flavors of smoke. Hickory, oak, cottonwood, mulberry and more are described on this page. About Baby Back Ribs Learn the ins and outs of preparing and smoking this delectable cut of pork. I want my babyback, baby back, baby back ribs! All About Pork Spare Ribs From trimming to seasoning to smoking, this page is full of information that will help you smoke some the the best tasting ribs ever. About Pork Shoulder If you love pulled pork, check out this page before you start. Pork shoulder takes a l - o - n - g time to smoke to perfection! And it's worth every minute of the wait. Keep a Recipe Log...Duplicate Perfection! Record all of the details of each cookout so you can improve your smoked and grilled food recipes to perfection, then be able to duplicate them on command. A must-read for serious pitmasters! All About Beef Back Ribs This page tells you what to look for when buying beef back ribs, and how to prep and cook them. How to Smoke Brisket Learn about choosing the right brisket, seasoning it, and smoking it low and slow to make it melt-in-your-mouth tender! About Smoked Turkey Smoked turkey is a delicacy. This page gives the details on the entire process, including choosing, brining, and smoking your turkey. Making Turkey Brine Here is the method that will get the most out of your brine ingredients and put them into your turkey. Cold Smoked Salmon If you've dreamed of preparing your own cold smoked salmon, this page goes over the details of this process. Hot Smoking Salmon A good introductory lesson that will give you the knowledge you need to hot smoke salmon. Salmon Brining Tips Great information about how to brine salmon. Salt is salt, right? Wrong! You'll learn all about salt here, too. Buying Salmon Nothing better than a good fillet of salmon in the smoker. But which species is best for smoking? What are the taste differences between the different varieties of salmon? Find out here. Gas Grill Smoking If you have a gas grill, but not a smoker, my tutorial page gas grill smoking will be of interest to you. For information about smoker cookers of all kinds, you'll find an overview at the meat smokers page. Smoker cooking is a fun way to create great tasting foods. With some meats requiring all day to smoke, the meat smoker in the backyard becomes the gathering place, the center of social activities. Pale blue smoke, a cold drink, and the hot sun. That's what it's all about! For more meat smoking tips and techniques, come back often and check for new additions. If you have a question about something and would like it included here, contact me.